During the past few years, I’ve come to terms with the fact that I’m just not that outdoorsy. And that’s OK.
Never mind that I live in the Northwest and that my friends and colleagues hike, kayak, climb rocks and sleep outside for fun. Sometimes I get to wade in rivers and brave the elements for work, and I enjoy the adventure. But it’s also OK when I find it challenging. I like to read. And I like to nap. I have chronicled a couple of the adventures that led me to this conclusion. They include a mountain goat survey for work. And the hike that made me realize that I would definitely hold Rob back if we were partners in the Amazing Race. I look proud of myself, don’t I? Rob had gotten it into his head to hike up to the Oyster Dome, spend the night and then do a TRX/portable kettlebell workout the next morning. I said, “Good luck with that. Enjoy.” But then he started acquiring all kinds of gear and it started to sound like fun. I said I’d go too, and we’d bring the dogs. Then I thought it might rain that night, and I chickened out. Then the weather was supposed to be really nice, and I was back in. 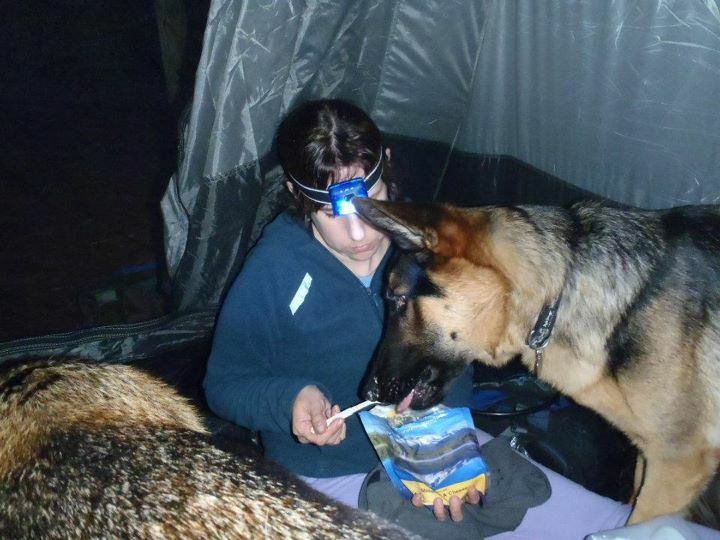 We got a tent, sleeping bags, camp food, headlamps, little reflecting things for the dogs. And I just committed to it. I was going to make it up there. It helped that it was not too hot, not too cold, and we left in plenty of time to get to the top before sundown. Because we would have had a hell of a time setting up camp after dark. 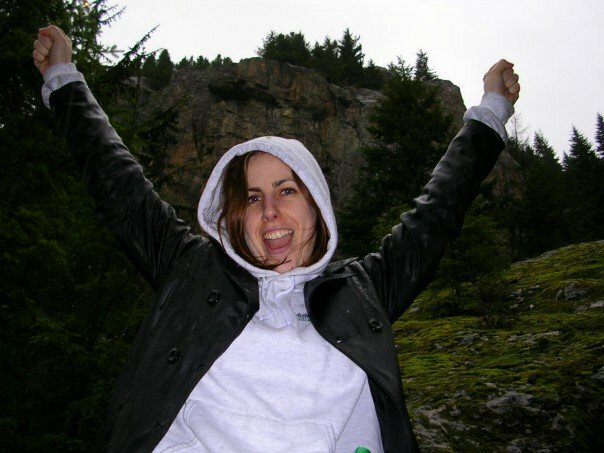 In my 2005 blog post, I was very descriptive about each step of that agonizing hike. This time, I was prepared for Rob to take off way ahead of me, but he was pretty weighed down by his backpack full of lanterns and a 2.5 gallon jug of drinking water, so for most of the hike, we were together. 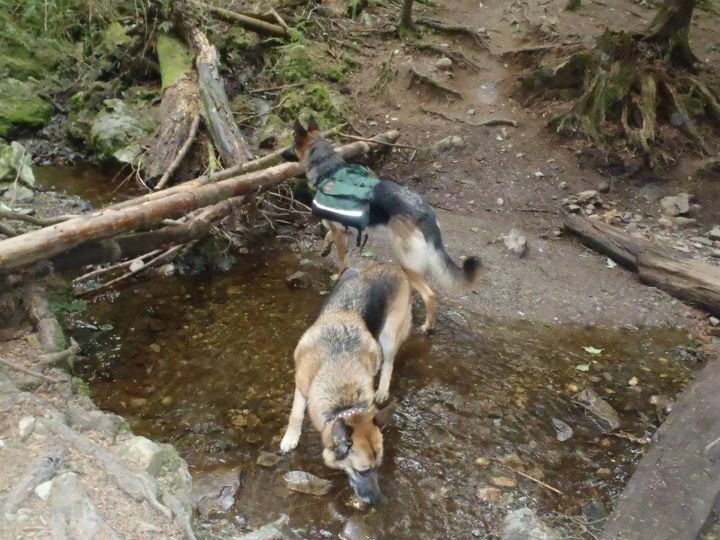 We strapped a backpack on Leo too, with his food and two bottles of water. It was a pretty heavy pack and he did seem tired. 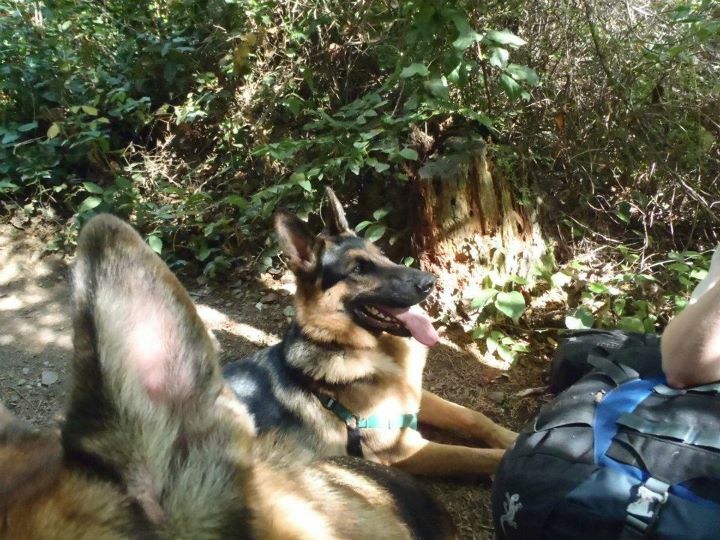 We took it off him during our many rest stops and he’d plop down beside us, looking enormously proud of himself. Each time we got up to go again, he’d stand, resigned to his duty, and let me strap that thing back on him. For the first half of the hike, he also had the burden of pulling me. 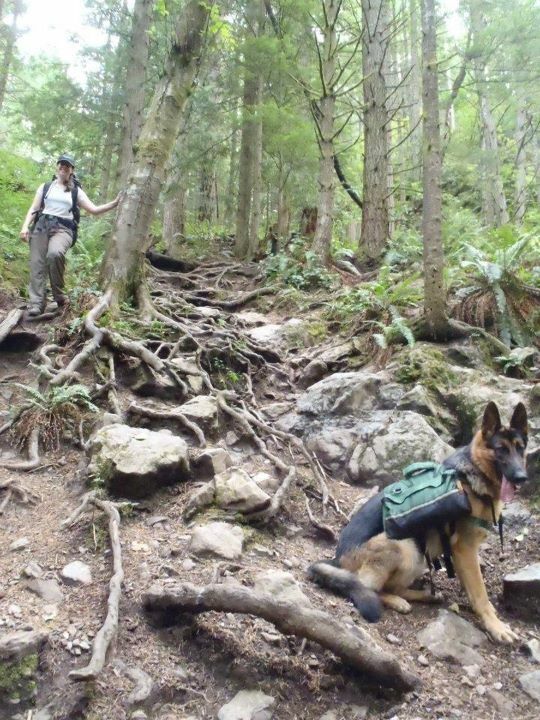 As we got to the steeper parts, I unhooked Leo’s leash as well. That’s when I fell behind. Mia was off leash almost the whole way, and would trot ahead, leading the pack, looking back at us frequently to make sure we were still with her. I worried the hike would be too strenuous for her, but she kept bounding ahead. 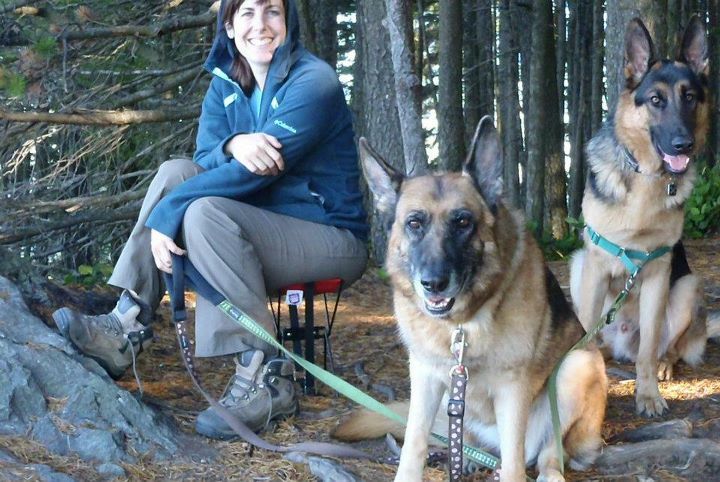 I don’t think I’m in such better shape than I was in 2005, although maybe I walk more often, because of the dogs, and I knew what to expect. We passed a couple of dry streambeds and I remembered how scary they were when they were filled with water. The last part of the hike was no joke. Very steep. At one point, I could take only five to ten steps at a time. I’d stop, take a few breaths, and count out steps again. I made it to twelve a few times. Then back to five. My feet were unsteady because of the weight of the pack. I struggled to find my footing amid the roots. 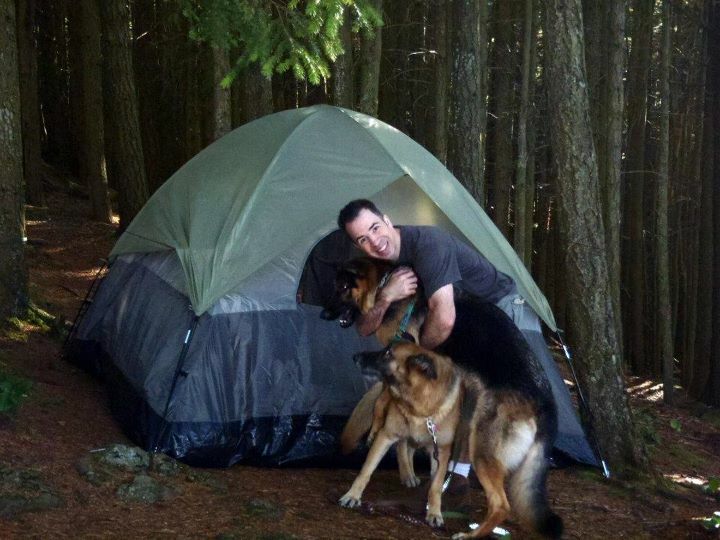 Rob and the dogs had climbed out of sight, but I didn’t have the devastated, abandoned feeling I had before. Even if I took only five steps at a time, I was going to get there. During the last stretch, I knew we were almost there. I could see sky between the trees. The trail was uphill, but smooth. No roots to trip me up. I made it. No one else camped up there with us, although we did see a guy carrying a wiener dog when we first reached the top. Carrying his dog, I think, so Leo wouldn’t eat it. “So this is the dome?” he asked. It was very near sunset and I didn’t envy him having to make that downward hike in the dark. Our dogs slept with us in the tent, and let us snuggle them more than usual. Mia makes an excellent pillow. I highly recommend a headlamp for late night bathroom trips in pitch black woods. Rob slept like a rock, as usual, but I barely slept, which was not entirely unexpected. I frequently have trouble sleeping in new places. Add to that the extreme physical exertion, and yeah, I’ll confess, I was in a great deal of pain. Too bad we both brought first aid kits with Band-Aids and Neosporin, but no ibuprofen. My legs ached. Not just in the muscles, but deep in the bones and joints. I couldn’t get comfortable even just lying there. Everything hurt. I remembered a similar feeling in my arms following an overzealous kayaking adventure in 2006. I also remembered it would not last. In the morning, I felt better, and Leo was antsy. I tethered him to a tree and tried to let him wander outside the tent. He kept winding himself around trees, and a few times tried to take down the tent by circling around it. I’d bring him back in the tent, hoping he’d settle down, but he wouldn’t, so I’d let him out again. Finally, after he was quiet for several minutes, I thought he’d just settled down outside. I gave the tether a gentle tug and felt its slack. I reeled it in, still slack, until I had in my hand, like a scene from a horror movie, the chewed-off end of a leash. “Leo chewed through the tether!” Rob didn’t even wake. I slipped on my hiking boots and said, “Mia, go find Leo.” Oyster Dome is basically a rock formation surrounded by cliffs. A dog could easily slide, jump or fall off one of them. I called Leo’s name a few times and he finally bounded toward us, romping with Mia through the trees until I clamped a leash back on his collar. Leo was duplicating his usual morning routine. He doesn’t want us to stay in bed all morning. He’ll start tearing at the bedsheets until I get up. But if I relocate to the couch, he’ll hop up on the chair across from me and go back to sleep. 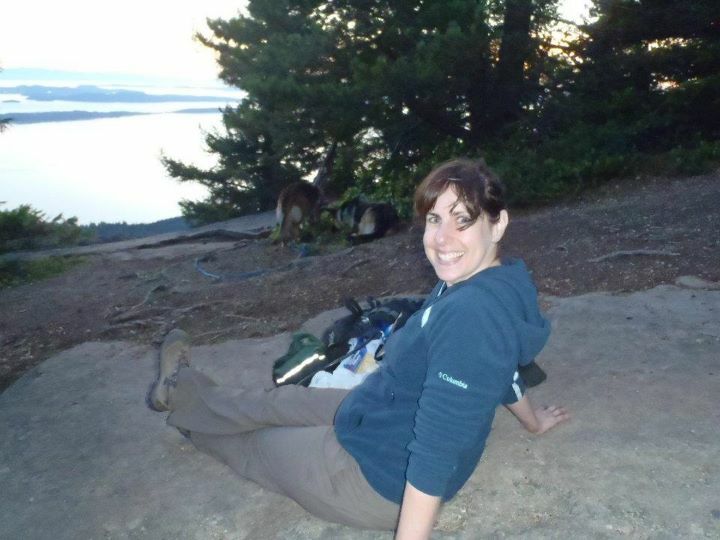 I grabbed my sleeping bag, leashed both dogs, and lay down on a nice slanty rock with a view of the bay. Rob woke up and started putting on his shoes to come join us, but we were interrupted by Leo’s territorial bark. Some rotten people had gotten up at the crack of dawn and summitted the Oyster Dome already. By this time, Leo considered the rock to be our new house, and he was going to protect it. Sorry, folks who thought you would experience a peaceful morning atop the dome. Sorry my dog ruined it for you. So we didn’t get a picture of me snuggled in my sleeping bag on the rock. We stretched with our TRXs, ate a leisurely breakfast and walked the agonizingly steep trail home. It was murder on the knees. Makes my knees hurt just reading about it.